Hide Empty Doc Classification Folders: Specifies whether to hide classification folders (folders representing Categories, Sub-Categories, and Content Types) that have no documents linked to their Content Types. Hide Reserved Doc Classification Folders: Specifies whether to hide reserved classification folders (folders representing Categories, Sub-Categories, and Content Types). Some types of Categories, Sub-Categories, and Content Types are reserved if they are not currently used in the content archive. If reserved classification folders are displayed, they look grayed-out. Show Category Codes: Specifies whether to display Category Codes. Folders - representing Categories, Sub-Categories, and Content Types – follow a naming scheme that combines Category Code and Category Name. You can display folders by Category Name only by unchecking this option. Show Display Names: Enables displaying customized Display Name for Content Types instead of their Preferred Names, which cannot be customized to meet an organization's needs. Show Content Item Labels: Enables displaying customized labels for documents (or Content Items) instead of their names that cannot be modified. Show Hidden Items: Enables displaying hidden parts of the tree. These parts are set to be hidden through Archive Visibility. Show Original Files: Enables displaying original non-pdf file linked to documents displayed in the content archive tree. Show Forms: Enables displaying forms linked to Content Types. 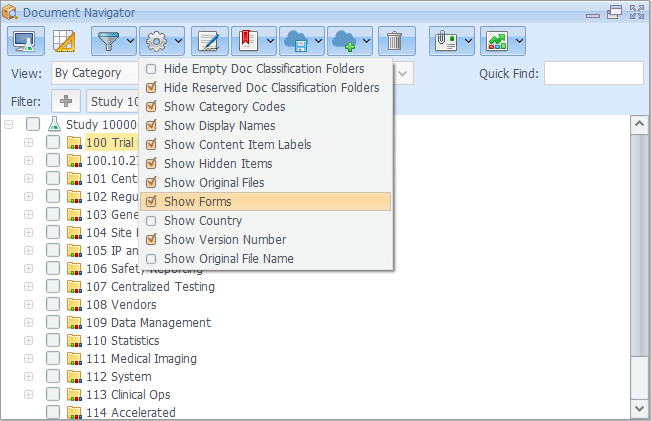 Show Country: Filters the content of the document tree by the metadata property Country. Show Original File Name: when checked, displays the original document name instead of the system generated name.